General oblique aerial view of Brindister, Middisfirth, looking E.
All that remains of this probable broch is a small heap of debris. All that remains of this broch is an area of heavy stone walling on the E side of an islet, which has been severely eroded. There are sufficient remains for positive identification as a broch but insufficient to assess its dimensions. A ruinous causeway runs from the islet to the W shore of the voe. 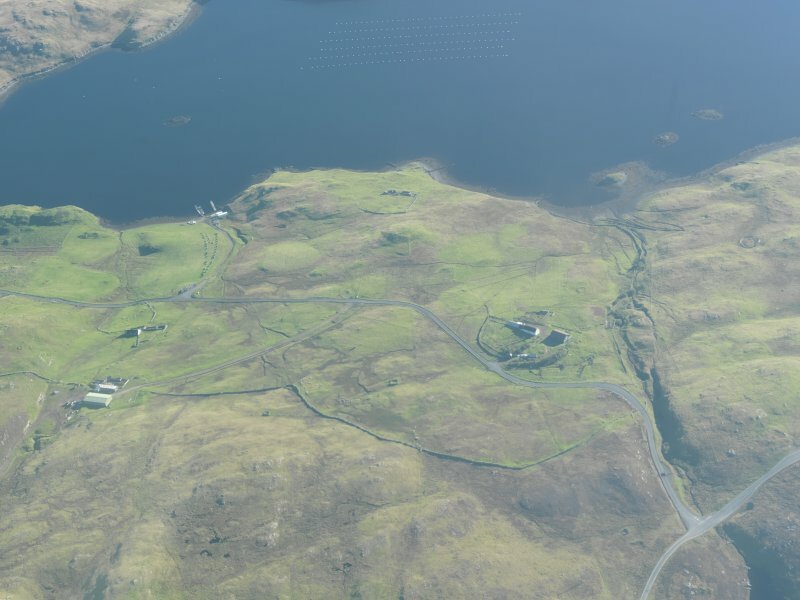 Probable broch in Sandsting, on an islet a short distance from the west shore of Brindister Voe. In 1969 some heavy stone walling was seen on the east side, enough for a positive identification . Sources: 1. OS card HU 25 NE 6: 2. RCAHMS 1946, vol. 3, no. 1399, 102.